Ned was feeling sad, he hated goodbyes, especially involving the people he loved. Yet he couldn’t help but feel a bridled sense of excitement for the adventure soon to come. For more than a year he had been apprenticing with Lady Grainne’s parents, Peleas and Olwen, honing and fine-tuning his artisan skills in what was her childhood home; Rose Lodge. 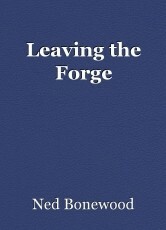 His training had been very tough, with a gruelling schedule of study and endless hours at the forge, but with unwavering determination, dedication and hard work, he’d got through it and had become a proficient and highly-skilled artisan. During his time with them, Peleas and Olwen treated Ned like one of their own, and he quickly came to think of them as family, so he had mixed emotions the day Peleas, Grainne’s father, sat him down to tell him the words that would push his life-path into the next chapter. Pelias, on the surface, was an intimidating character; tough, fearlessly outspoken and blunt, his personality the polar-opposite of Ned’s. In the beginning, he seemed irked by Ned’s somewhat benign demeanour, although during the first month or so, he regularly had fun with it at Ned’s expense, goading him, getting him rattled and in a panic about various things before laughing and revealing it was a joke. Ned just took it on the chin. Being of Dawn, he was accustomed to some degree of torment, and Peleas’s practical jokes were mild compared to what he’d suffered in the past. Having a benign and affable nature whilst living in a culture driven by bravery, reckless ambition, glory in battle, and where 'might makes right', was never going to be a smooth ride, but it didn't deter Ned from chasing down the one thing he truly wanted; to become the best artisan the nation had ever seen. During his first few weeks at Rose Lodge, Ned felt very wary of Peleas, but over time as they got to know each other, mutual respect, and eventually a bond, began to develop between them. Peleas’ reputation was widely-known. To many, it was for his outrageous Varushkan foul-temper, something Ned had seen, and bore the brunt of, on many occasions. To others, it was for his legendary craftsmanship; His ability to create the most beautiful high-quality weapons, armour and magical items. His work was sought-after by Nobles and leaders from across the nation. Ned would never forget those memorable words spoken to him that day. Ned was never thrilled about being called boy, but after a while, he’d come to understand the context of it and realised it was just the old man’s way. He’d seen him use that same term on others, including grown men, and the occasional arrogant Dawnish Noble, just to be intentionally antagonistic. Most of the time though, Peleas addressed Ned by his name. Only when a matter was important or essential, would it be, ‘boy’. It was such a simple statement, yet profound. Ned knew the full implications of those few chosen words; his training at Rose Lodge was over. Now it was time for him to set out into the world and begin his artisan career on his own terms, safe in the knowledge that he’d learned from the best. Of course, Ned always knew this day would come, he’d been meticulously planning ahead for it, he just didn’t realise how sad he would feel about leaving. Olwen, Grainne’s mother, had treated him like a son, with love and kindness. She had a big heart and generosity of spirit, and he adored her for it. They were like kindred spirits. She had become a big part of Ned’s daily life, and with her mobility issues, he had been a big part of hers. He had been instrumental in helping her physically get through each day, but knowing he would be leaving soon, he couldn't help but worry about her. ‘How will she cope without me?’ He felt torn about leaving her to struggle on herown, but gained solace knowing Peleas would be there to step-in after he had gone. Despite Peleas being, quite possibly, the grumpiest, foul-tempered man he had ever met, he was also the most loyal. During his time at Rose Lodge, Ned had seen enough to know under that harsh Varushkan exterior, lurked a heart of gold, one that really cared deeply for Olwen. He knew she was in good hands and would be just fine. It was early morning. A light mist hung over the land as the sun glimpsed through the sleepy treeline. Hazy light-beams bathed the entire front of Rose Lodge in a soft golden light. Ned was stood outside, his backpack and satchel on the ground beside him. Peleas and Olwen were both there to see him off. Olwen had insisted on cooking him a hearty breakfast to see him on hisway, and had packed several days of food to keep him going on his journey. Peleas was unusually quiet. Ned looked up at him and noticed his eyes were reddened and glazed. It shocked him. Was the most intimidating, angriest man he’d ever met, getting misty-eyed about him leaving? Ned was genuinely going to miss Peleas. Despite still occasionally being intimidated by him, he'd developed huge repect for the man and felt a close bond with him. Once he'd figured out how to get through the day without triggering Peleas's spontaneous temper, he started to get a better understanding of the man, and why he was like he was. According to Olwen, Peleas had never let anyone get close, especially close enough to learn about his past, yet Ned could recall the numerous times the old man had shared with him those terrible stories of hardship and suffering that had essentially shaped him into the person he was. He realised the signficance of the trust Peleas had placed in him, it was not something he took lightly. Ned could feel a lump forming in this throat. “I’m going to miss you, Peleas, you grumpy old sod!” he grinned, but unable to prevent tears from welling in his own eyes. He extended his hand toward the man for a handshake. Peleas ignored it, instead reaching forward and pulling Ned into a vice-like bear-hug. “You have made me proud,” Peleas sniffed. He let go and hurried away, not looking back, retreating inside the Lodge. Ned stood there looking surprised, unsure if he’d done something wrong. Olwen stepped close and took his hands into hers. “Don’t worry, he'll be alright” she smiled, “I can't believe it though. Tears? Peleas? In all this time he's never got like that for anyone, well, except for Grainne, and no, Ned, she doesn't need to know that," she winked. Ned nodded, understanding. "See, he's just a big old softy at heart," he grinned, "but you can let him know his secret is safe with me, I won't tell a soul." "He will be very relieved about that,” she chuckled. “It's just that, well, he's really going to miss having you around, Ned, a lot more than he's letting-on..." she gave a long sniff in a fruitless attempt to hide her immense sadness, "...and so am I!" she whimpered. The forest track was peaceful and allowed Ned to gather his thoughts as he walked. He would soon be reaching the nearby village of Hawthorn. From there, his long journey back to Fairhaven, his home, would begin. He looked forward to being reunited with friends and family, and in particular, his own parents who he hadn't seen for over a year. He planned on staying there throughout the winter months. He'd always enjoyed spending the darker evenings at home, the cosy gathering of friends at the hearth sharing stories and songs they enjoyed. He also needed to check-in on his green Iron ore mine and oversee some of the planned upgrades, but mostly, he just needed a rest before the next major chapter in his life began; the building of his new Forge in the Dawnish town of Belletain. © Copyright 2019 Ned Bonewood. All rights reserved. This page was created in 0.5297 seconds.